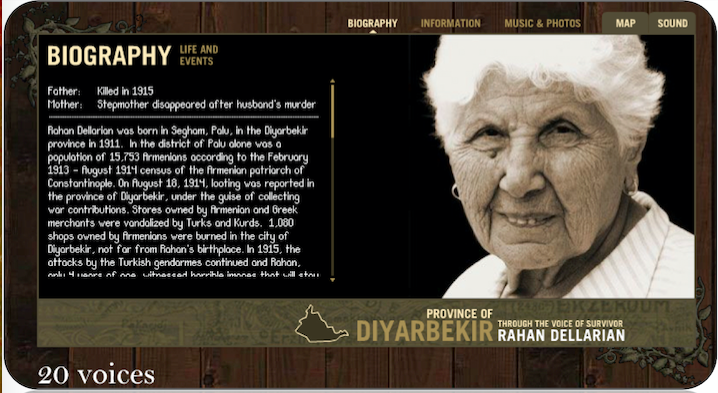 Utilizing the “Twenty Voices” interactive online map by Araz Artinian and accompanied by a lesson plan created by The Genocide Education Project, this exercise allows students to get a glimpse of the historic homeland of the Armenians that was completely erased in only a few years, from 1915-1923. Students learn what survivors had, what was lost, and can begin to imagine the impact of this trauma on the rest of their lives. 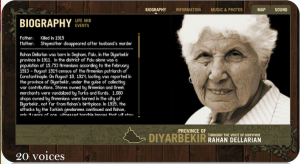 Focusing on the experiences of individual survivors helps to personalize and contextualize the massive numbers of people who perished in the Armenian Genocide as well as other genocides. Numbers like 11 million, 1.5 million, and 800,000 become abstract figures that students accept without much thought. By learning about individual experiences during genocide, students gain a stronger sense of connection to the event—the numbers are humanized.